The aim of this study was to as se ss the effectiveness of open reduction and internal fixation of Neer type II unstable lateral third clavicle fractures using the clavicle hook plate (HP). In the last decade, the clavicle HP has been in use. Reports about this plate have showed a high success rate in terms of union. However, there is still concern as regards rate of mid-term complications, particularly the involvement of the acromioclavicular joint (ACJ). To evaluate the results and mid-term effects in use of this plate, we performed a prospective analysis with a mean follow-up of 17 months (1.45 years) of 20 consecutive patients with acute displaced lateral clavicle fractures, treated with the clavicle HP. Short-term functional results in all patients were good to excellent. All but one (95%) patient had a united fracture. Five (25%) patients developed impingement symptoms, and in two (10%) patients fsubacromial osteolysis was found. These findings resolved after plate removal. Twenty patients were evaluated at a fixed initial follow-up visit, 3 months postoperatively, and re-evaluated at a mean follow-up period of 1.45 years. The final Constant Shoulder score mean was 95.5 and the disabilities of the arm, shoulder and hand score (DASH) mean was 3.54 preoperatively compared with 92.9 and 4.26, respectively, before plate removal (P = 0.000). One (5%) patient developed ACJ arthrosis, which was symptomatic. Two (10%) patients had extra-articular ossifications, of which one was symptomatic. There was no relation between the impingement symptoms, subacromial osteolysis, and development of ACJ arthrosis or extra-articular ossifications. The clavicle HP is a good primary treatment option for acute displaced lateral clavicle fracture with few complications. At mid-term, the results are excellent, and no long-term complications can be attributed to the use of the plate. Distal clavicle fractures account for ∼21% of all clavicle fractures . Three types have been demonstrated based on the relationship of the fracture line with the coracoclavicular (CC) ligaments and acromioclavicular joint (ACJ) , [Figure 1]. Neer type I fractures occur between the ACJ and the CC ligaments. Neer type III fractures are characterized by the extension of the fracture line into the ACJ. These two types are stable with minimal displacement because the proximal fragment is stabilized by the CC ligaments, and they are usually treated with nonsurgical techniques. Neer type II fractures occur more medial to the CC ligaments and often result in a major displacement because of complete or incomplete rupture of the CC ligaments, resulting in higher rates of nonunion ranging from 21 to 44% with nonsurgical management ,,,,. 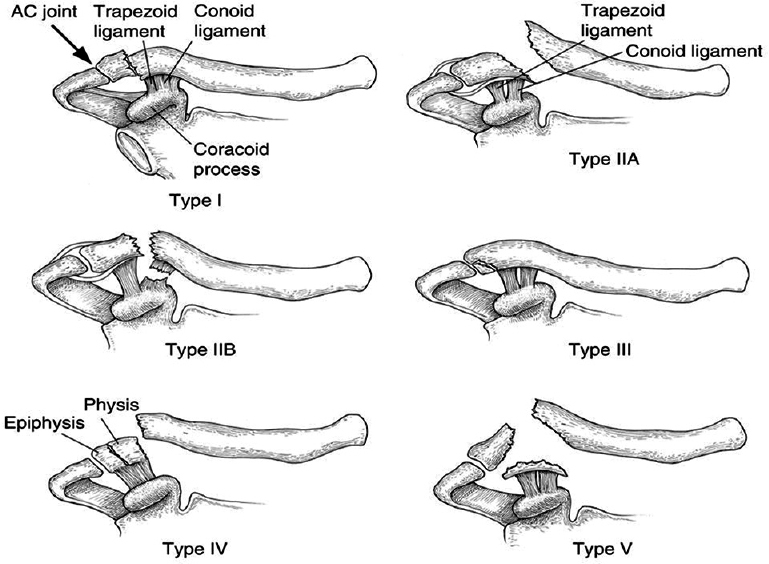 Figure 1: Neer classification of lateral third clavicle fractures showing type II fractures. AC joint, acromioclavicular joint. Distal third fractures are further subclassified according to the location of the CC ligaments relative to the fracture fragments. As a result, surgical treatment has been recommended for Neer type II fractures ,. Type I fracture occurs distal to the CC ligaments (i.e. trapezoid and conoid) and involves minimal fracture displacement. The ACJ remains intact. Type IIA fracture occurs medial to the conoid ligament. Type IIB fracture occurs between the CC ligaments and includes disruption of the conoid ligament. The trapezoid ligament remains intact. Type III fracture occurs distal to the CC ligaments and extends into the ACJ . Many surgical procedures have been developed for the treatment of Neer type II distal clavicle fractures, including transacromial Kirschner wires and Knowles pins ,, the Weaver-Dunn procedure , tension band wires ,, CC screw fixation ,, plate fixation ,,,, and arthroscopic treatment ,,. None of these is generally regarded as the gold standard treatment. One popular method of surgical management is AO clavicular hook plate (HP) fixation with an extension under the acromion, which provides more rigid fixation and good bone union rates ,,. In the present study, we prospectively reviewed the clinical and radiological outcomes of unstable distal end clavicle fractures fixed with a HP [Figure 2] to evaluate the bone union, range of motion, shoulder function, and rate of postoperative complications. 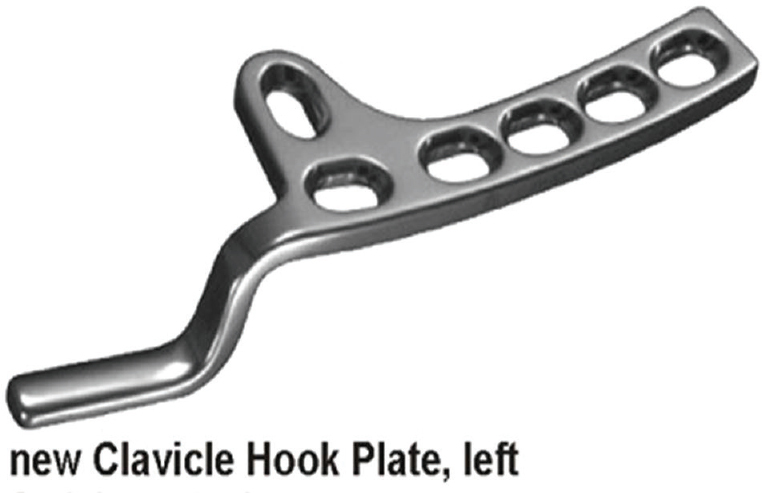 Figure 2: Clavicle AO hook plate. Twenty patients with Neer type II lateral third clavicle fractures were included in this study. The patients were admitted in the Orthopedic Department, Menoufia University Hospital, during the period from March 2013 to March 2015 with a follow-up period of 6–48 months. The approval of medical ethic committee of Menoufia University was obtained, and written consent was obtained from all patients. All patients were treated using the same technique of open reduction and internal fixation using clavicle HPs. Inclusion criteria were as follows: age greater than 12 years, Neer type II lateral third clavicular fractures, closed fractures, acute and unilateral fractures, and normal shoulder function before injury. Exclusion criteria were as follows: loss to postoperative follow-up, ACJ dislocation, pathologic fractures, previous surgery on the affected clavicle or shoulder, accompanied injuries, and incomplete data. Objective and subjective shoulder function evaluation was performed with the DASH and Constant Shoulder scoring systems, after which patients were radiographically assessed. Plain anteroposterior radiographs were used to evaluate bone union every 4 weeks. Radiographs were interpreted for both fracture healing status and implant position. Radiographic union was defined as either a bridging callus over the fracture sites or fracture gap obliteration. Hardware removal was arranged immediately after noting bone union. Our surgical technique consisted of application of basic reduction and plating methods, following the operative procedure as advised by the 'Synthes clavicle HP – technique guide' (2003; Synthes, West Chester, Pennsylvania, USA). The patients were operated in beach chair position under general anesthesia (all patients in our study), with the arm on the affected side freely moveable. A sagittal incision was made just medial to the ACJ over the fracture. Full-thickness skin flaps were prepared until the clavicle. The fracture was reduced, and large comminuted fragments were temporarily fixed with Kirschner wires and sometimes a lag screw was used. No repair of the torn ligaments was performed. Any interposed tissue was removed. Without opening the ACJ, the location of the joint was marked with a needle and confirmed with fluoroscopy. The soft tissue dorsal to the ACJ (so that there will be no impingement of the rotator cuff in the critically tight anterior subacromial space) was dissected and prepared for the insertion of the hook. First, the 15 mm hook depth was used and passed below the acromion. The shaft of the plate was placed on the superior aspect of the clavicle and checked for alignment. No excessive levering with the plate was performed to reduce the fracture. According to the patient's anatomy, a hook depth of 15 or 18 mm was used. The clavicle portion of the plate was slightly bent to ensure central placement of the plate on the clavicle. The tip or hook portions were never bent. Before definitive fixation, plate position and full shoulder motion were verified using fluoroscopy. The plate was then secured to the shaft with four 3.5 mm cortical screws, approximating the plate to the clavicle. If necessary, the distal metaphyseal end was secured to the plate through the anterolateral holes with cancellous screws. In patients with osteoporotic bone, a longer plate (eight holes plate) was used. Following the fixation, the wound was thoroughly irrigated and then was closed in two layers over the plate. Postoperatively, the arm was placed in a sling and the patient was allowed early active motion in the form of pendulum exercises. At 10–14 days postoperatively, the wound was checked and the stitches were removed. The sling was then discarded and full range-of-motion exercise programs were implemented. The sling protection could be extended in some cases if the quality of fixation was questionable. At 6–8 weeks, if radiographs were favorable, resisted and strengthening exercise programs were implemented. Return to full contact and unpredictable sports was discouraged until 12 weeks postoperatively. Although hardware removal is typically optional for those with conventional plates, it can be anticipated that a high percentage of individuals with HP fixation will require plate removal to regain terminal shoulder flexion and abduction. This was performed at a minimum of 4 months postoperatively according to the signs of full fracture site healing. Patients were discharged from the hospital within 48 h. All patients were followed up at 2 weeks for removal of sutures and then at an interval of 6 weeks until the fracture union was noted. DASH and Constant Shoulder scores were applied twice. First time was in the initial follow-up (3 months postoperatively) and the other one was applied in the final follow-up after plate removal. According to these criteria, 20 patients were included in the study (14 men and six women). The mean age at the time of presentation was 32.1 years, ranging from 13 to 63 years. Six injuries were caused by motor vehicle accidents and 14 by a fall from a height. The mean time from injury to surgery was 3.45 days (range, 0–12 days). The injured side was the right shoulder in 12 patients and the left in eight patients. The mean operative time was 53.9 min (range, 41–65 min). The plate was removed under general anesthesia (4–11 months postoperatively). The short-term (initial) follow-up of patients was fixed at 3 months postoperatively. The mean mid-term (final) follow-up was 1.45 years (17.4 months) (range, 0.7–2.2 years). As regards short-term results and complications [Table 1], the mean Constant Shoulder score was 92.9 (75–98) and the mean DASH score was 4.26 (0–16.5), which is an excellent result [Figure 3]a,[Figure 3]b,[Figure 3]c,[Figure 3]d. During the outpatient clinic follow-up, seven patients reported pain (cases 2, 4, 5, 6, 11, 15, and 16). Five of these patients were diagnosed with impingement, and this resolved shortly after plate removal. The remaining two cases (cases 2 and 16) had developed symptomatic hardware, and this also resolved shortly once the plates were removed. In two patients (cases 4 and 7), lucency around the tip of the plate was noted, radiologically diagnosed as subacromial osteolysis (SAO). One of these patients also had impingement complaints. After plate removal, the osteolysis disappeared on follow-up radiographs. One patient (case 14) was diagnosed with a nonunion due to a misplaced hook of the plate. This patient developed an asymptomatic nonunion with a good alignment of the fracture, probably due to fibrous alignment of the ligaments. Another patient (case 15) developed a superficial wound infection that was treated successfully with oral antibiotics. The plate was removed as soon as possible after full radiological union and consolidation, by minimum 4 months postoperatively. All patients were advised to remove the plate after clinical and radiological consolidation. All patients were operated upon for plate removal. All fractures but one (case 14) were clinically and radiologically united. There were no perioperative or postoperative complications except what were shown. Subjectively, all patients described their shoulder function as good to excellent at the moment of discharge from the outpatient clinic. There was a patient (case 19) with delayed union (union after 8 months). 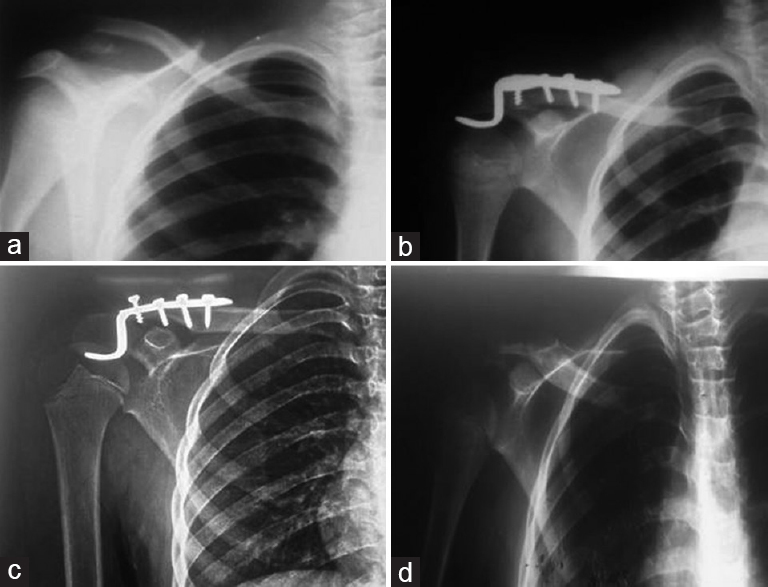 Figure 3: Anteroposterior views plain radiograph: (a) a displaced Neer type II distal right clavicular fracture in a 13-year-old boy following fall on the ground; (b) immediate postoperative radiograph with hook-plate fixation and (c) 3 months postoperatively. (d) plate removal post operative. As for the mid-term results and complications [Table 1], the mean Constant Shoulder score was 95.5 (68–100) and the mean DASH score was 3.54 (0–29.17). The lowest Constant Shoulder score (68) was of a patient (case 14) whose fracture site showed nonunion and developed distal fragment osteolysis. The second highest DASH score (13.3) was from the patient with the lateral clavicle resection due to the unresolved symptomatic ACJ arthrosis. A nonunion in one patient (case 14) was confirmed radiographically. In one patient, ACJ arthrosis was observed. In two patients (cases 5 and 17) extra-articular ossification (EAO) was noted. Only in one patient (case 5) impingement, a lower Constant Shoulder score (88), and a higher DASH score (5) were observed. Failure of fixation was encountered in a case. In this case (case 5), radiologic assessment 3 weeks following operation revealed that the plate was unhooked from beneath the acromion. However, fracture reduction was maintained; hence, the plate was left in place until the shoulder developed an impingement, and then it was removed. Significantly better Constant Shoulder and DASH scores were obtained when the HP was removed compared with not being removed, and the best results were found with removal before 6 months. Statistical studies analyzed factors affecting our study, such as age, early plate removal, plate removal, good fixation technique, and mode of trauma. Age: There was a high negative correlation between age and score after plate removal. The younger the patients, the faster and more completely the fractures united [Table 2]. Moreover, the patient's age was an important parameter with a high statistically significant correlation with long-term complications [Table 3]. Early plate removal: There was a high statistically significant difference as regards patient's prognosis between early and late plate removal. The earlier the plate was removed, the better was the prognosis [Table 4] and [Table 5]. Plate removing: There was a high correlation between before and after plate removal Constant Shoulder scores as regards patients' shoulder joint function. The score figures increase after plate removal, which signifies better shoulder joint function [Table 6]. Good fixation technique: Unhooked acromion by the HP was associated with some short-term and mid-term complications [Table 7]. 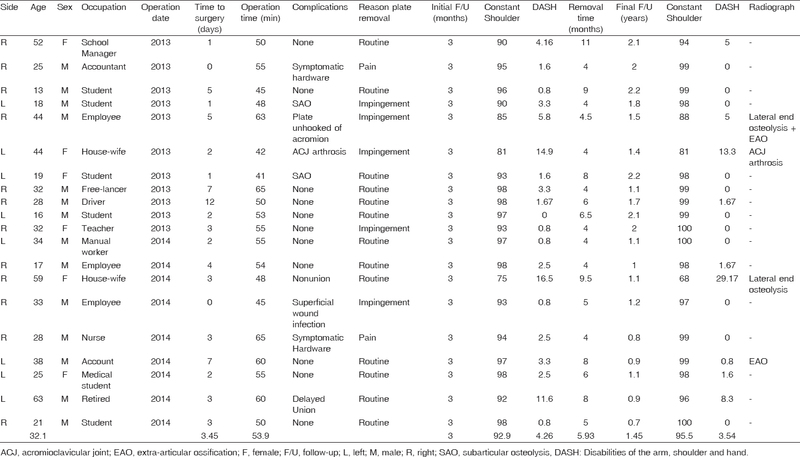 Mode of trauma: Some short-term and mid-term complications such as EAO, ACJ arthrosis, lateral end osteolysis, delayed union, and nonunion were associated with high-energy trauma (motor vehicle and motorcycle accidents) with a high statistically significant correlation between them [Table 7] and [Figure 4]. Figure 4: The same case photographs showing the patient range full shoulder motion after plate removal (DASH: 0; Constant Shoulder: 99). (a) forward flexion 180° (b) Lateral elevtion 180° (c) full external rotation (d) full internal rotation interscapular (T7-12). Clavicle fractures are a common injury, representing ∼2.6–4% of adult fractures and ∼35% of injuries to the shoulder girdle . They tend to occur in young male population during sports activities when a direct force is applied to the point of the shoulder. A second incidence peak in older patients is related to falls, particularly in women with osteoporosis. There are several schemes for classification of lateral clavicle fractures. Of these, the Neer classification is widely used . Neer type I fractures are minimally displaced fractures that occur lateral to or between the intact CC ligaments. Neer type II fractures occur at the level of CC ligaments, with the trapezoid ligament remaining attached to the distal segment. Type II fractures can be further divided into type IIA, in which the conoid and trapezoid ligaments both remain attached to the distal fragment, and type IIB, in which the conoid ligament is torn. Type III injuries occur distal to the CC ligament and enter the ACJ. Because they are unstable and prone to nonunion, type II distal clavicle fractures are often treated surgically . Types I and III fractures are typically treated nonoperatively, but type III injuries have a greater risk for osteoarthritis due to the joint trauma. A number of surgical techniques have been developed for Neer type II fractures. These include CC screws, Kirschner wire fixation, and rigid metal plating. These procedures have had significant problems with hardware failure and migration. In addition, plate fixation cannot be used if the distal fragment will not support two or more cortical screws. In the late 1980s and early 1990s, a new clavicular HP was developed for the treatment of these fractures. This device is marketed and manufactured by Synthes. It is gaining increased acceptance and use by orthopedists, although it may not be familiar to most radiologists. The device is inserted by selecting the appropriate plate size and then inserting the hook underneath the acromion, posterior to the ACJ. The plate portion is then fixed to the medial clavicle with multiple screws. Biomechanical studies have confirmed that rotational movement occurs between the clavicle and acromion, which results in problems for rigid fixation methods. The clavicle HP is designed to address this problem by maintaining the biomechanics of the ACJ. This allows a degree of early mobilization and avoids the need for reconstruction of the CC ligaments . Studies comparing the Kirschner wire fixation and HP techniques have shown that the clavicle HP has fewer complications and allows earlier mobilization ,. Despite these advantages, complications can occur if the HP is retained. The first category is related to the freely movable hook of the plate that is placed posterior to the ACJ, below the acromion, and above the supraspinatus tendon. Even though the design of the HP promotes fracture healing by keeping the fracture fragments reduced without interfering with the rotational movement of the clavicle, this design also leads to complaints due to mismatch between the hook of the plate and the diverse anatomy of the acromion. ElMaraghy et al. demonstrated the mismatch between the plate and the subacromial space, leading to several well-described short-term complications in an anatomic study. In 89% of the specimens the hook perforated the subacromial bursa, in 60% the tip had contact with the supraspinatus tendon, and in 60% contact with the acromion was concentrated at the tip of the plate. These findings clarify the subacromial bursitis, the impingement complaints, and the SAO, respectively. They concluded that the anatomy of the acromion is too diverse to accommodate a single HP; when necessary, the hook and the tip of the plate need bending, and smaller depths of the hook should be selected if necessary, especially for women. Lee et al. performed arthroscopy during the procedure to verify the position and fit of the hook and tip besides intraoperative fluoroscopy verification. If necessary, the tip and the plate were bent according to the required anatomy of the patient. They also had access to the new locking compression plate, which comes in a smaller depth of 12 mm. In this series, none of the patients suffered impingement. However, they still encountered SAO (17%) and subacromial bursitis (22%). Muramatsu et al. found it necessary to bend the hook in 77% of their patients, and found in most of their patients migration of the hook after fixation. Their operative technique describes, however, forcefully reducing the fracture using the plate as a lever. Pressure concentration at the tip of the plate that leads to subacromial erosion due to the rotation of the clavicle when the implant is retained for a longer period becomes unavoidable in some of the patients. Similarly, contact with the supraspinatus tendon in some cases is unavoidable; even though there is no contact during the operation, the contact may happen when abducting the arm during the rehabilitation period. Even though aforementioned short-term complications have the potential of acromion fracture and supraspinatus tendon rupture, these complications have never been reported with this plate in the literature . In this group of patients, five (25%) patients had impingement complaints and SAO occurred in two (10%) patients. These complaints were mild and all patients could complete their rehabilitation program. None of these patients developed a frozen shoulder or required early plate removal before full union and bone consolidation took place. The impingement complaints as well as SAO resolved after plate removal and had no mid-term consequences. Another complication is a fracture medial to the plate that can be seen with a minimal trauma. This complication has only been described with a retained implant after fracture healing ,. This complication did not appear throughout our interventional study. The last category of complications is typical complications of plate osteosynthesis, such as fixation failure due to osteoporotic bone and deep infection of the plate ,,. Several long-term complications associated with the lateral clavicle fracture have also been described in relation to the use of this plate. These are ACJ arthrosis and EAOs. Because of the proximity of this plate to the ACJ, several authors discourage the use of this plate ,. When placed correctly, the plate does not violate the ACJ. However, the vertical part of the hook passes behind the ACJ; this part of the plate could violate the joint if the plate migrates anteriorly, but this is almost impossible when secured rigidly on the shaft. ACJ arthrosis and EAO have been described in all types of lateral clavicle fractures in studies in which there was longer-term follow-up. Nordqvist et al. described a cohort of conservatively treated lateral clavicle fractures with a mean follow-up of 15 years. They reported seven ACJ arthroses in 89 patients. Five of these occurred after a type I fracture, one after a type II, and one after a type III fracture. EAO was observed in eight cases. 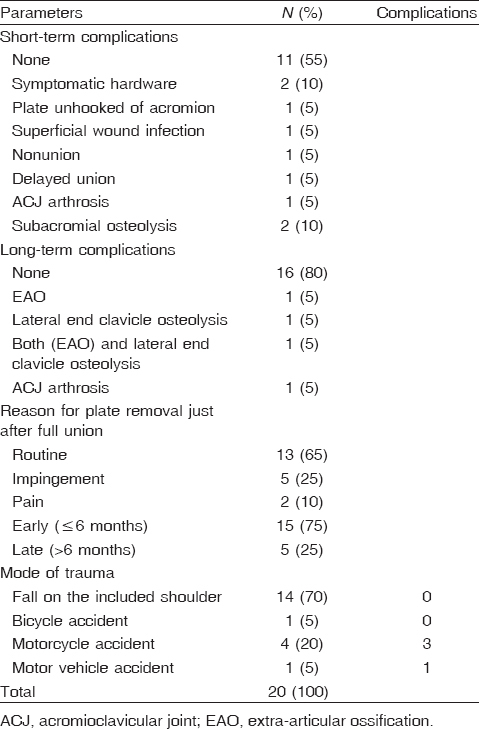 Robinson and Cairns  described a prevalence of 9–15% of ACJ arthrosis in patients with conservatively treated lateral clavicle fractures. Flinkkila et al. described 63 patients with displaced lateral clavicle fractures treated with the clavicle HP. Fifty percent of the patients were clinically re-evaluated with a mean follow-up of 3.6 years. Ten of 31 (32%) patients who were followed up had mild asymptomatic ACJ arthrosis. We analyzed our patient population to find a relation between the occurrence of ACJ arthrosis and EAO detected at mid-term follow-up and signs of a mismatch between the plate and the subacromial space such as impingement and SAO. In our study, one (0.5%) patient had ACJ arthrosis, which was symptomatic. Two (10%) patients had EAO, of which one was symptomatic. Only one of the patients with EAO had suffered impingement and had no signs of SAO; however, he developed mild lateral end clavicle osteolysis. Even though the numbers are small to perform statistical analysis, we found no relation between ACJ arthrosis, EAOs at mid-term follow-up, and the typical short-term complications occurring due to mismatch of the plate tip and the acromion. In light of previous publications ,, on lateral clavicle fractures, ACJ arthrosis and EAO are more likely to be caused by the initial trauma to the joint and the ligaments rather than a complication that can be addressed to the HP. The strength of this study is in its high rate of follow-up duration, the uniformity of the included fractures, and the number of included patients for such fractures. To our knowledge, this study has the longest mean time of follow-up in the literature concerning primary operative treatment of acutely displaced lateral clavicle fractures with the clavicle HP. We operated on all displaced lateral clavicle fractures; a possible selection bias is the age of our patient population as our series is younger than some described series. Younger patients have fewer complications due to better bone quality and better circulation of tissues, which could explain the low percentage of infection and the high percentage of union in our report. We conclude that clavicle HP fixation is a good primary treatment for the displaced lateral clavicle fracture. It facilitates early mobilization of the shoulder postoperatively and results in a high percentage of union with a good objective and subjective shoulder function. Some of the treated patients do develop impingement symptoms and SAO due to a mismatch between the plate and patient anatomy without leading to functional impairment. These complications can be minimized by meticulously adjusting the plate to the individual anatomy with verification under fluoroscopy and/or arthroscopy. This is why the plate has to be removed after fracture consolidation. Mid-term follow-up shows no additional damage to the surrounding structures that can be attributed to the use of this plate. In summary, the AO HP results in a high union rate with a good return of function. We advocate contouring the plate at the time of the surgery and removal of all metalwork at 4 months. We do not recommend its use in the osteoporotic bone. This is a small series, and a larger number of patients are required to lend statistical support to the merits of this technique. Nevertheless, the high union rates and the excellent short-to-medium term function scores are very encouraging, and the use of the AO HP is now our preferred method of management of the displaced lateral third clavicle fractures. Nordqvist A, Petersson C. The incidence of fractures of the clavicle. Clin Orthop Relat Res 1994; 300:127–132. Neer CS II. Fracture of the distal clavicle with detachment of the coracoclavicular ligaments in adults. J Trauma 1963; 3:99–110. Neer CS II. Fractures of the distal third of the clavicle. Clin Orthop Relat Res 1968; 58:43–50. Deafenbaugh MK, Dugdale TW, Staeheli JW, Nielsen R. Nonoperative treatment of Neer type II distal clavicle fractures: a prospective study. Contemp Orthop 1990; 20:405–413. Robinson CM, Cairns DA. Primary nonoperative treatment of displaced lateral fractures of the clavicle. J Bone Joint Surg Am 2004; 86:778–782. Rokito AS, Zuckerman JD, Shaari JM, Eisenberg DP, Cuomo F, Gallagher MA. A comparison of nonoperative and operative treatment of type II distal clavicle fractures. Bull Hosp Jt Dis 2002; 61:32–39. Bisbinas I, Mikalef P, Gigis I, Beslikas T, Panou N, Christoforidis I. Management of distal clavicle fractures. Acta Orthop Belg 2010; 76:145–149. Pujalte GG, Housner JA. Management of clavicle fractures. Curr Sports Med Rep 2008; 7:275–280. Wang SJ, Wong CS. Extra-articular knowles pin fixation for unstable distal clavicle fractures. J Trauma 2008; 64:1522–1527. Anderson K. Evaluation and treatment of distal clavicle fractures. Clin Sports Med 2003; 22:319–326. Kao FC, Chao EK, Chen CH, Yu SW, Chen CY, Yen CY. Treatment of distal clavicle fracture using Kirschner wires and tension-band wires. J Trauma 2001; 51:522–525. Badhe SP, Lawrence TM, Clark DI. Tension band suturing for the treatment of displaced type 2 lateral end clavicle fractures. Arch Orthop Trauma Surg 2007; 127:25–28. Macheras G, Kateros KT, Savvidou OD, Sofianos J, Fawzy EA, Papagelopoulos PJ. Coracoclavicular screw fixation for unstable distal clavicle fractures. Orthopedics. 2005; 28:693–696. Jin CZ, Kim HK, Min BH. Surgical treatment for distal clavicle fracture associated with coracoclavicular ligament rupture using a cannulated screw fixation technique. J Trauma 2006; 60:1358–1361. Kalamaras M, Cutbush K, Robinson M. A method for internal fixation of unstable distal clavicle fractures: early observations using a new technique. J Shoulder Elbow Surg 2008; 17:60–62. Kashii M, Inui H, Yamamoto K. Surgical treatment of distal clavicle fractures using the clavicular hook plate. Clin Orthop Relat Res. 2006; 447:158–164. Tambe AD, Motkur P, Qamar A, Drew S, Turner SM. Fractures of the distal third of the clavicle treated by hook plating. Int Orthop 2006; 30:7–10. Muramatsu K, Shigetomi M, Matsunaga T, Murata Y, Taguchi T. Use of the AO hook-plate for treatment of unstable fractures of the distal clavicle. Arch Orthop Trauma Surg 2007; 127:191–194. Nourissat G, Kakuda C, Dumontier C, Sautet A, Doursounian L. Arthroscopic stabilization of Neer type 2 fracture of the distal part of the clavicle. Arthroscopy. 2007; 23:674.e1–674.e4. Checchia SL, Doneux PS, Miyazaki AN, Fregoneze M, Silva LA. Treatment of distal clavicle fractures using an arthroscopic technique. J Shoulder Elbow Surg 2008; 17:395–398. Pujol N, Philippeau JM, Richou J, Lespagnol F, Graveleau N, Hardy P. Arthroscopic treatment of distal clavicle fractures: a technical note. Knee Surg Sports Traumatol Arthrosc. 2008; 16:884–886. Khan LA, Bradnock TJ, Scott C, Robinson CM. Fractures of the clavicle. J Bone Joint Surg Am. 2009; 91:447–460. Charity RM, Haidar SG, Ghosh S, Tillu AB. Fixation failure of the clavicular hook plate: a report of three cases. J Orthop Surg 2006; 14:333–335. Flinkkila T, Ristiniemi J, Hyvonen P, Hamalainen M. Surgical treatment of unstable fractures of the distal clavicle: a comparative study of Kirschner wire and clavicular hook plate fixation. Acta Orthop Scand 2002; 73:50–53. Flinkkila T, Ristiniemi J, Lakovaara M, Hyvönen P, Leppilahti J. Hook-plate fixation of unstable lateral clavicle fractures: a report on 63 patients. Acta Orthop 2006; 77:644–649. ElMaraghy AW, Devereaux MW, Ravichandiran K, Agur AM. Subacromial morphometric assessment of the clavicle hook plate. Injury 2010; 41:613–619. Lee KW, Lee SK, Kim KJ, Kim YI, Kwon WC, Choy WS. Arthroscopic-assisted Locking Compression Plate clavicular hook fixation for unstable fractures of the lateral end of the clavicle: a prospective study. Int Orthop 2010; 34:839–845. Nadarajah R, Mahaluxmivala J, Amin A, Goodier DW. Clavicular hook-plate: complications of retaining the implant. Injury 2005; 36:681–683. Chandrasenan J, Badhe S, Cresswell T, Beer J. The clavicular hook plate: consequences in three cases. Eur J Trauma Emerg Surg. 2007; 5:557–559. Kaipel M, Majewski M, Regazzoni P. Double-plate fixation in lateral clavicle fractures: a new strategy. J Trauma 2010; 69:896–900. Jackson WF, Bayne G, Gregg-Smith SJ. Fractures of the lateral third of the clavicle: an anatomic approach to treatment. J Trauma 2006; 61:222–225. Nordqvist A, Petersson C, Redlund-Johnell I. The natural course of lateral clavicle fracture. 15 (11-21) year follow-up of 110 cases. Acta Orthop Scand 1993; 64:87–91.